The PNG Hunters have dropped a bombshell naming a new halves combination and recalling a Digicel Cup player for Sunday’s round 22 Q-Cup match against the Ipswich Jets. In a press release yesterday, fringe squad member William Mone has been named at halfback while Gahuna Silas, who normally comes off the bench as acting half, will play five-eighth. Hunters captain Ase Boas and younger brother Watson were named on an extended bench for the crucial home fixture. Skipper Boas, who is the club’s lead points scorer with 166 points, seems to have paid the price for his side’s poor form over the last two games. The Hunters have drawn one match (22-22 v Cutters) and lost one (28-12 to Dolphins) after coming off the bye in round 20. 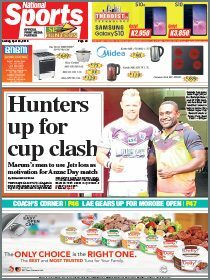 Despite leading the competition on 33 points and with four games left of the regular season, a loss to the Jets could see Marum’s side slip to second spot. The Jets, who have a dangerous attacking style could cause serious problems for an under-prepared home side. Mone — the Hela Wigmen playmaker — was a shock inclusion in a revamped halves combination with Gahun Silas with Hunters management explaining the perplexing move as one done to rest key players for the finals. The notable change was the return of former Hunters forward Timothy Lomai to the fold. Lomai, who was dropped from the squad in the pre-season and has not trained with the squad nor been named as likely candidate for inclusion in the team is set to start in the back-row with David Loko. 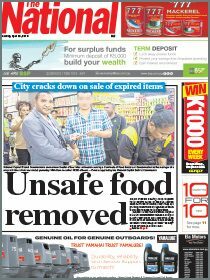 The Southern Highlander has been playing for the Lae Tigers this year and a spokesman for the Hunters said the club had been monitoring the progress of the forward throughout the season and his form was deemed good enough to warrant inclusion. The biggest risk is the Mone-Silas halves combination which is inexperienced to say the least at Q-Cup level. Team management have stuck with the explanation that Boas brothers are being rested — they have been named on an extended bench — but with momentum a key element the Hunters’ finals charge making unforced (injury or judiciary related) changes to the play-making positions is sure to raise eyebrows. Mone will become player No.54 if the coaching staff keep him in the No.7 jersey. Meanwhile, yesterday’s training sessions was cancelled after sources close to the team claimed some players had petitioned Marum. Management went into a meeting last night to discuss the issues raised.